Fresh Food Garden | Put Food on Your Table! Put Food on Your Table! This coloring book is more than a book with fun coloring pages for children and adults, it will also help you learn about the joy of gardening and putting fresh food on your table. Allow me to share with you my project of the last two months…The Urban Farming Coloring Book! I had a ton of fun with this project. I think it’s something adults, and kids, and families, can all do together. I didn’t want this to just be a coloring book. 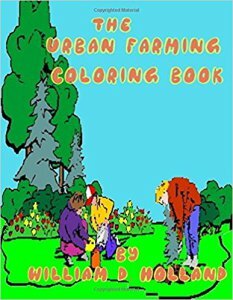 I wanted it to be informational as well, so that’s why every “chapter” has information about one aspect of urban farming…how to raise chickens…how to prepare soil…how to compost…how to raise worms….and so on, with a corresponding coloring page. 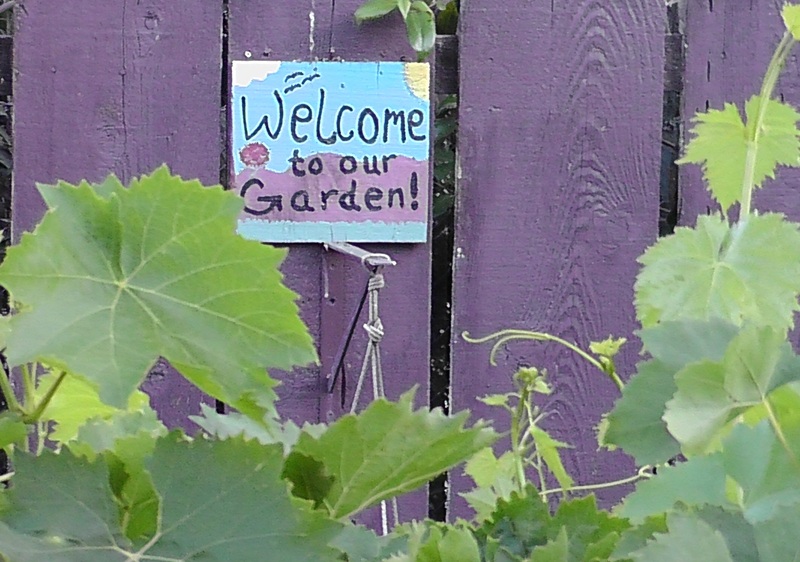 I wanted to share this blog with you because it comes from a gardener with a true spirit for the urban farm lifestyle. His story represents what we urban gardeners are experiencing right about now (October). I hope you enjoy his experience and connect it with your own experience and know that we gardeners live a wonderful lifestyle. I swear to the gods, there has to be a cosmic joke going on. It can’t possibly be October already. I need to make a deal with the devil and slow up the passage of time. Kidding about the devil, of course! It’s been awhile since I wrote on this blog. My fault and nobody else’s. I’m so busy trying to finish a novel, and keep my writing blog going strong, that I simply let this blog sink slowly under the weight of disinterest. Mea culpa, mea culpa, mea maxima culpa! SO, WHAT DOES OCTOBER MEAN ON AN URBAN FARM? There is no end to the work on an urban farm, or for that matter, for any gardener. Planning a vegetable garden for the colder months requires a little bit of information and strategy. First, you need to know what your hardiness zone is and then you need to know the first frost date and the first freeze date. Once you have this knowledge at hand, you can begin to plan your garden so that the vegetables you plant will be safe and thrive during the cold harsh weather of winter. Every location has a hardiness zone. The hardiness zone is a measure determined by the United States Department of Agriculture (USDA) as a standard for the likelihood of a particular plant’s ability to grow successfully in a particular geographic location. The hardiness zone takes into consideration the minimum likely temperature for each region. The USDA has an interactive hardiness zone map that allows you to look up your hardiness zone by entering your zip code. Once you determine your hardiness zone, next you need to know when the first frost and when the first freeze are expected to occur in your area. I have found an easy to use source to generate this information. Whenever I want to know the first frost and first freeze dates, I go to The How Do Gardener. This is a helpful and informative website that utilizes information gleaned from the National Climactic Data Center and uses an interactive service, much like the USDA interactive hardiness zone map, to provide you with the first frost and first freeze dates. You simply enter your zip code and the dates are automatically presented to you. After learning your hardiness zone and the first frost and freeze dates, you now need to decide what to plant. I live in northern California, in Hardiness Zone 9. I need to be sure the vegetables I plant on October 1, 2015 will mature before the first freeze date which traditionally follows about two weeks after the first frost date. Since the first freeze date in my zone is December 1, 2015, I need to select plants that will become mature and will be able to be harvested before December 1, 2015. 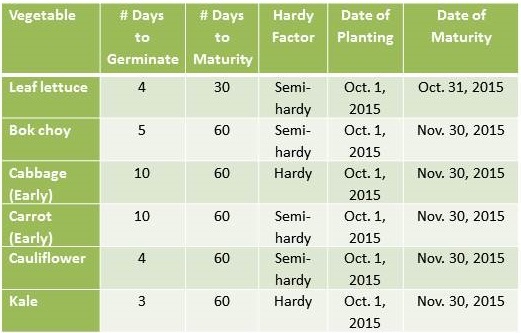 Most seed packets have the number of days to maturity and other helpful planting information on the back. Note that hardy plants can tolerate freezing temperatures. Even so, they need to be planted in order that by the time freezing weather occurs, the plant is mature enough to withstand the harsh, excessive temperatures of 32° degrees Fahrenheit or below or 0° degrees Celsius or below. I selected these plants because of the number of days to maturity. These plants will be mature before the first Freeze Date, according to my location. The first frost date in my area is November 11, 2015, so my biggest concern is keeping the vegetables from being harmed by the harshness of cold weather. Although the vegetables you plant in October are considered hardy or semi-hardy, they still need a small level of protection from frost and freeze. Prior to the first frost date, place some type of mulch on top of the dirt at the base of the plants. Mulch is a ground cover that can help keep the soil from becoming overly cold. Types of Mulch include hay, straw, alfalfa, barks, hulls, grass clippings, garden clippings, dried leaves, recycled wood, and gravel. As well as using mulch to cover the soil, place a protective barrier such as plastic or a fabric made specifically for outdoor weather over the plant. This should be sufficient enough to protect the plant from frost. When using plastic, be sure to remove the plastic when the sun comes out. This will allow the plant to breathe and let excessive moisture evaporate. Whether you use a mulch, a plant cover, or both, your plant should have enough protection from becoming harmed by extremely cold temperatures. No matter what season, you can put delicious fresh food on your table all year long. The joy of gardening includes walking out and picking something to include with a meal every day. Zucchini, tomatoes, lettuce, and radishes are still producing and so I can make a delicious salad from these vegetables. I also grow grapes in my garden and while grapes are a fruit, the grape leaves can be cut and eaten raw. So while I am waiting for the grapes to mature, I can use the grape leaves in the salad without harming the actual fruit. Here is a recipe for a very simple salad using zucchini and grape leaves. Place all ingredients into a medium sized-bowl. Toss and serve with your desired dressing. 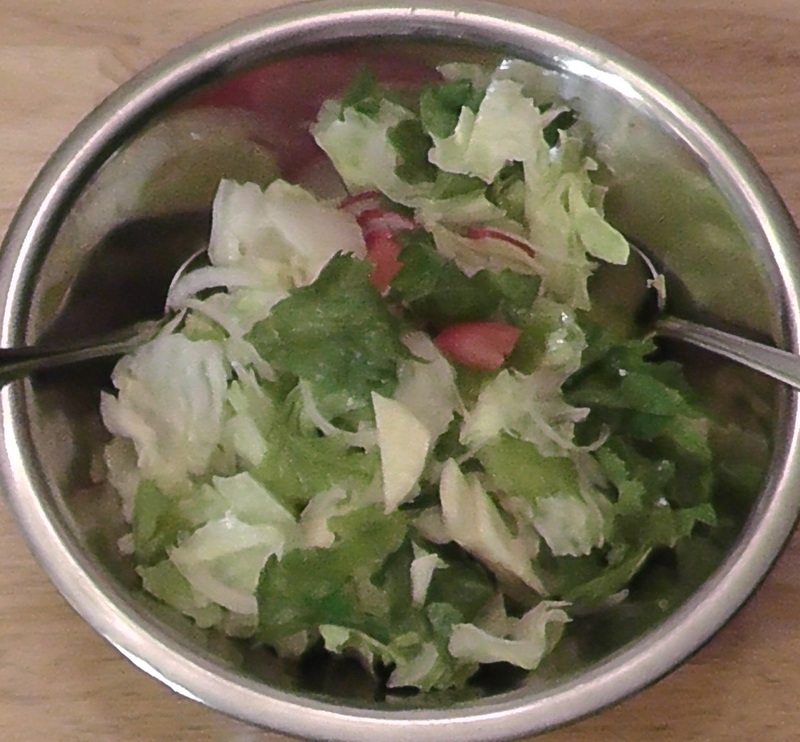 This recipe makes a large dinner salad for two people or a small side salad for four people. I had a wonderful opportunity to be a guest blogger for a fellow gardener’s blog. 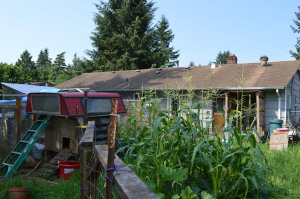 In this blog post I share the reasons why I became an urban farmer. I hope it inspires you to take up gardening as a hobby or as a way of life. A cobbler is a baked fruit-filled dish with a thick pastry crust that is dropped onto the fruit filling. Some people like to cover the entire top with the crust, sealing the fruit filling under the pastry. 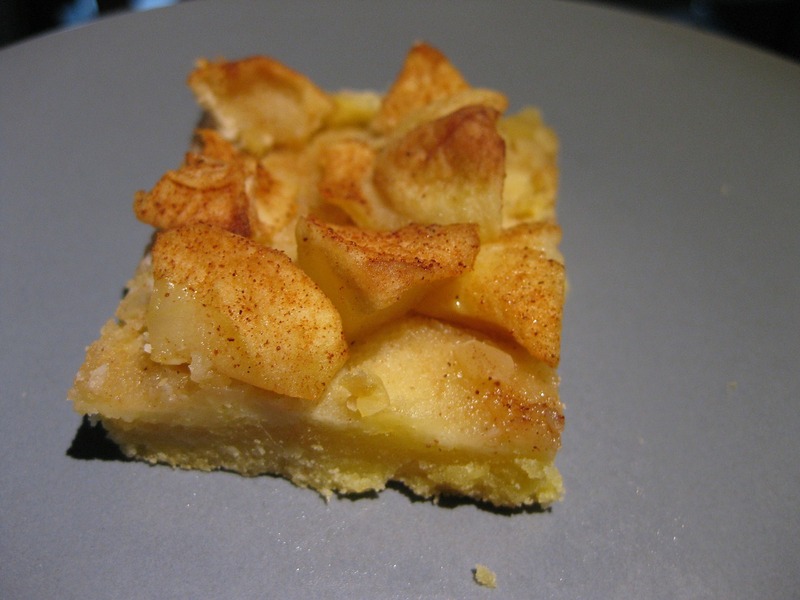 The pastry can be crumbly or flaky like a biscuit. My mom use to layer the fruit and crust like lasagna. I actually prefer it that way because you get mouthfuls of the moist pastry which has soaked up the filling flavors and then you get the texture of the buttery, flaky crust from the top layer. It’s a real taste treat for your mouth. So yummy! Anyone who grows zucchini knows that once zucchini season starts you will have an abundance of zucchini. You’ll either have to share your harvest with neighbors, family, and friends, or get creative with different ways to serve this fine vegetable. I discovered a delicious zucchini cobbler that is made with only eight ingredients: zucchini, lemon juice, sugar, cinnamon, flour, butter, and nutmeg. The zucchini comes from my garden and the other ingredients are staples in my refrigerator or pantry. I can make this cobbler any time during zucchini growing season. I never would have thought to use zucchini in a dessert recipe like a cobbler, but this recipe is too quick and too easy to pass it by. The creator of this recipe includes lots of vibrant photos to help you see, as well as, read how to make this tasty dessert. Try it. I think you will like it. September brings the delight of the final harvest of the fall season. Take a stroll through a gardener’s delight in the bounties enjoyed until next spring when nature delivers another round of goodness from the ground. Remember the Cabbage Patch Kids? Me too! I’m growing cabbage this year and every time I walk past the cabbage patch I think of the Cabbage Patch Kids. I can’t seem to get those cute little images out of my mind. Last year, my cabbage patch did not do well. I rotated my crops this year and so the cabbage is now located in a completely different area of the garden. It is doing very well in the new location. 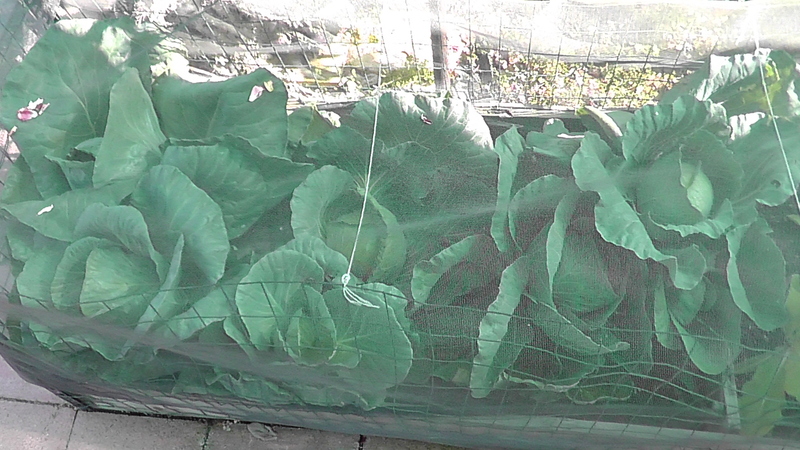 Last year, I grew lettuce where the cabbage is growing now and the lettuce produced moderately well. Honestly, this year the cabbage is doing better in this location than the lettuce did last year. My husband and I enjoy coleslaw, so it is only natural that we grow cabbage. In our garden, we also grow onion and carrots. We pick those and add them to the coleslaw. We make coleslaw that doesn’t have a lot of ingredients and is quick to make. We like to shred the cabbage and carrots very thin and the onions so thin you can almost see through the slices. The texture of these thinly prepared veggies, creates a dance on the tongue that makes this dish fun to eat. You can serve this vegetable combination with Ranch Dressing and a little cracked pepper and it will taste divine. We like a vinegar based slaw and more than that, we like to make our own dressing because then we know what’s in it. Place vinegar, sugar, oil, salt, and pepper into a small bowl. Whip with a fork until blended well. Set this dressing aside. 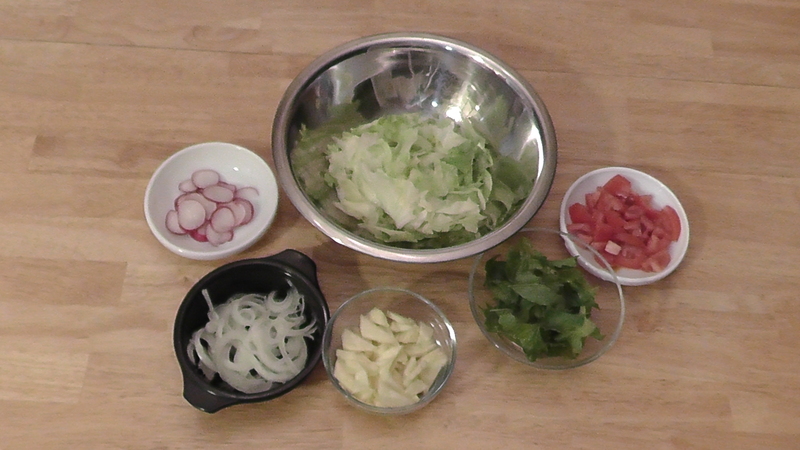 Place onion, cabbage, and carrots into a large bowl. Toss until the veggies are distributed well. Pour dressing over veggies. Toss until veggies are well-coated with the dressing. One time, I made this coleslaw without the sugar and it tasted alright, but it didn’t have the flavor punch that I expect to have when I eat coleslaw. So, while I don’t like the added sugar, I do like the added flavor. I also tried making the dressing with a sugar substitute; that didn’t work either. So now, while I’d prefer not to have the added sugar, I put the sugar in the mix. Flavor wins! It’s a compromise I’m willing to live with. I hope you enjoy your coleslaw.